It has gone very cold overnight. There were moths in the trap, but nothing to compare with this spectacular visitor to Tom and Abi, my son and daughter-in-law in Mexico City. Before I go on any further, btw, you must check out Abi's range of home-made cards on her fledgling website http://lorisandb.blogspot.com/ Order now! Anyway, in between these and other occupations, T and A have already grown blase about hummingbirds visiting the flowers on their balcony. 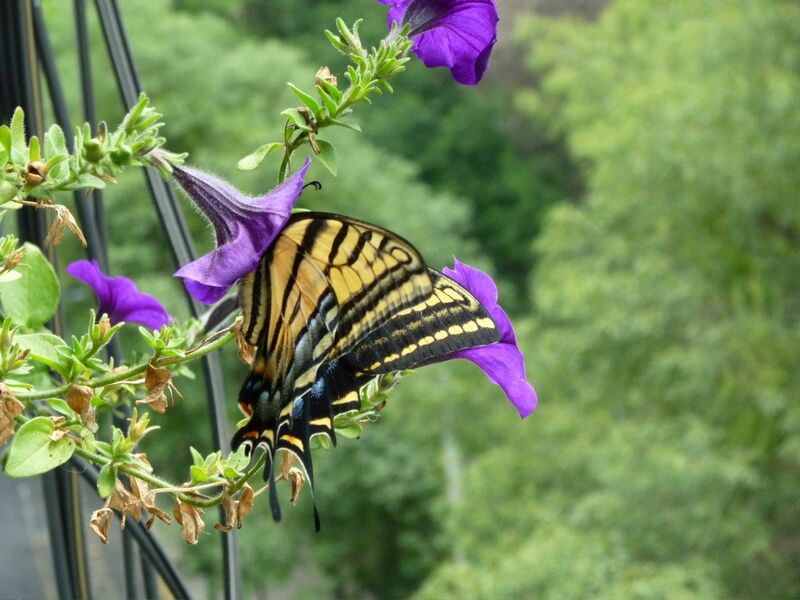 With luck they will also get used to calls from Swallowtails like this. It looks very like the 'British' Swallowtail (hardly ever seen in Britain, mind, outside the Norfolk Broads and seldom even there) and the version which Penny and I saw on Paxos. But, like most American things, bigger. Here it is again, getting really stuck in to the Mexican version of a petunia. I think, after a little Googling and Wiki-ing, that it's a Tiger Swallowtail although nothing is ever simple. The United States has four slightly different variants of this one species: the Eastern Tiger, Western Tiger, Canadian Tiger and even Appalachian Tiger. On the score of uncertainty, I am very taken with this comment in the preface to Tom Tolman and Richard Lewington's marvellous (really marvellous) Collins Butterfly Guide which my mother-in-law Dilys has just given me. In a tribute to the late Lionel Higgins and Norman Riley, whose British and European butterfly guide the new book effectively replaces, Tolman says of Higgins, with whom he worked on butterfly identification:'I was impressed by his uncommon, although tacit regard for the need for circumspection in the pursuit of science: indeed, I do not believe we ever provided a complete solution to any problem.' Words which climate scientists (and, even more, environmental journalists) would do well to take on board. One humble pic from the trap, meanwhile. I know I featured it last week, but the Gold Spot is a very attractive moth. Also there were a Silver Y, many assorted yellow underwings, the odd Beauty and a Setaceous Hebrew Character. Oh, and an alarming number of wasps. They chew our garden furniture to build, or at this time of year presumably repair, their papery nests, and this is a pain. Excitement! After 316 posts, this blog proudly presents (I hope) its first film. If you're familiar with the Blogspot system, it has all these wonderfully simple icons and instructions (and all free) but I've never managed to overcome my suspicion and disbelief of the one which you click on, and a bubble comes up saying 'Add video'. I've also never had a video to add. Yesterday, however, our excellent in-laws in Dorridge, Suri and Radha, emailed this mini-movie from Radha-iPhone productions of a Small Tortoiseshell which flew into their house and made strenuous efforts to get back to the sunshine. I've rated it PG, because the poor thing batters around a bit before perching on Radha's finger; and also the film ends before the actual happy ending, of the butterfly's safe release. This did, however, duly happen, so maybe there will be a sequel. Tortoiseshell 2 - The Open Air. Sleepyheads this morning. A record-breaking Lesser Swallow Prominent - more on that shortly - and this dozy pair above which had no objection to posing by my teaspoon. The yellow one is, I think, an Angle-striped Sallow, a moth which has visited us before at this time of the year. Once nationally scarce, it is increasing its range southwards from strongholds around and beyond the Scottish border. Its companion is a Setaceous Hebrew Character, a moth lumbered with a particularly clumsy name. Setaceous means whiskery or bristly, neither of which obviously applies to the poor creature. The Hebrew character is more appropriate; the dark mark on the wings resembles the Hebrew letter Nun, as is the case in the otherwise unrelated (and unsetaceous) Hebrew Character moth. 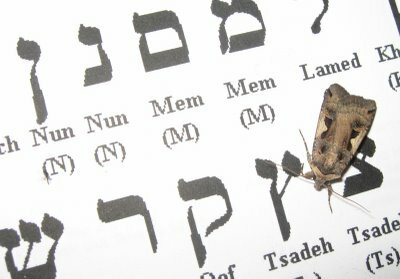 A couple of years ago, I photocopied the Hebrew alphabet from a dictionary and got a sleepy Setaceous Hebrew Character moth to pose by Nun. I'll try to find the date and add it here (See bottom of post for exciting PS...). Meanwhile here are the Angle-striped Sallow (above) and the SHC (right) viewed more normally, to show their full and attractive wing patterns. The Lesser Swallow Prominent, meanwhile, is now into its 50th hour of undisturbed sleep. I wish I could manage that, although I always fall asleep during the 10pm TV news and also as soon as I lie down with my head on its side. The moth came to the trap two nights ago and has clung to the rain-shield support ever since. There is nothing to stop it flying away whenever it wants to, but the lamp at night and natural light by day are keeping it in the Land of Nod. This was it two days ago (left), and below it slumbers on towards September. Here's my lunch yesterday, a lovely spread prepared by Dorothy and Stuart Webb of Honley, friends from the heroic days when my Dad fought and won Colne Valley in Yorkshire for the Liberals by wafer-thin majorities after elections where every vote mattered and you got into deep discussion on countless doorsteps. I remember moths and butterflies coming up in these chats occasionally, not so much in terms of the 'green' debate as would probably be the case these days, but via sympathy for the depredations of 'cabbage white' caterpillars. You get quite crafty after canvassing electors from your early teens, and I think I knew how to give the impression, as opposed to actual commitment, that cabbages would fare better under the Liberals. Well, now we have a Liberal (Democrat) deputy prime minister and several members of the Cabinet. But as you can see from this second photo, the promised land is only coming slowly. I was very pleased, though, to get a close-up of the perpetrator, as I'd told Dorothy that I wanted to feature her and Stuart's lovely garden, partly because she is a faithful reader of this blog. Actually this butterfly - the Small White, making its third appearance here in less than a week - isn't actually guilty. It used to be, in its previous life as a caterpillar, but now it's seen the light and drinks only nectar. Normally, as previously described, whites are nervy and hard to photograph. But this one was a bit damp after a shower, I think. You can see the droplets on what's left of the sprouts leaf. Note too, that even though the butterfly can't get away, it isn't flustered and is actually making good use of the water by drinking it - see the proboscis out. How disgusting! A sort-of very dilute cabbage juice. Now, I promised to show D & S's garden, the glory of Honley. It would need a separate blog to do it justice, but here are a couple of glimpses. Their tomatoes are just fabulous too. For the first time ever, I saw a moth escape from the trap this morning. I sympathise now with police or prison officers who look stupid when inmates vault over walls or tie sheets together. I was so surprised and interested that I didn't reach for the camera to film the episode until it was too late. Had the moth known, it was about to be released anyway, but that shouldn't take the shine off its enterprise. It basically flew up to the collar and then scrabbled through, passed a Swallow Prominent slumbering on the lamp wire and a Canary-shouldered Thorn perched on the rim, and whirred away. It was one of the various types of yellow underwing which have now infested the eggboxes every day for at least a month. Above is a picture of just a fraction of them, prior to gentle removal into the safety of the undergrowth (or the other thing I do is blow gently at them which stirs them into fluttering off under their own power). They are great sleepers; about a quarter rest comfortably upside down, and these two on the right look for all the world like a couple of amorous pensionerswho have fallen out of their deckchairs into one another's arms. I sometimes wonder if moths' patterns and colouring have influenced many dress designers. They are so modest and subtle, as in the case of this Shuttle-shaped dart. I don't think ermine collars are particularly in fashion these days, but I have liked them since childhood when a purple robe with a (fake) ermine collar - white with black dashes every now and then - was the favourite thing in our dressing-up box. The other mothy note about today was the season's first Copper Underwing, or more likely the almost imperceptibly different Svensson's Copper Underwing which is commoner in Yorkshire. I tried very hard to tempt it into showing its nicely coloured hindwings but it absolutely wouldn't. Its arrival means autumn is approaching, as if we didn't already know that. The weather is disappointingly dull and cold for August, although it was lovely (in the North only, Ha!) last week. What have moths got that we haven't? I mean, they don't have an inkling of blankets and teacups, let alone iPods or Pads. Where they do win, however, is on antennae. Just look at the TV-aerial like complexity of this Willow Beauty's headgear. Whether they would be considered a beautiful addition to the likes of Nicole Kidman is a moot point, but if we all had them I guess they would. There would be a whole industry of antennae colouring and grooming and debate about whether criss-cross or simple parallels were the most alluring. It could also be said that Denis Healey, the erstwhile Labour deputy leader, came quite close with his famous eyebrows. What do antennae do? They carry an incredible battery of sensors for the insect which allow it to fly fast and safely, warn of danger and carry out other tasks. My camera is incapable of showing the intricate structure of the tiny fronds, although it hasn't done too badly in terms of giving the general idea. I'm grateful to Wikipedia, that excellent free source of knowledge, for this electron micrograph of a wasp's antenna, which looks far simpler to the human eye than the feathery version on the Willow Beauty. 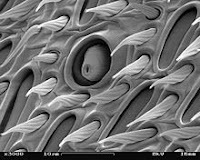 Why some moths are graced by such beautiful structures while others have something resembling a snippet of wire is the subject of much discussion. It looks as though light has something to do with it as butterflies, which overwhelmingly fly only by day, all have simple, straight antennae ending in a little club, like a match. One other observation. We've had an odd combination of warm weather and wind which has divided the butterfly men from the boys. Most managed brief outings, including Peacocks, Commas and a Holly Blue which flits about our rambling wisteria, but the common-or-garden Whites really showed their mettle. They soared about, looking for all the world as though they enjoyed it when a gust swiped them sideways over the lawn. Just like children (of all ages) on a Disney ride. I photographed this one having a break, so now I've got my 2010 picture of a Small White here, as well as the ones at Boroughbridge a couple of posts down. Two handsome overnighters here, both protected against the light rain which fell by the light trap's excellent rain-shield. Mr and Mrs Robinson, the husband-and-wife entomologists who designed the Robinson Trap were clever people. Also unusual. Moth-studying seems usually to be a passion of one or the other in a couple, though Penny is wondrously encouraging (and indeed gave me both the trap and my moth Bible (Waring, Townsend & Lewington) as birthday presents). As the former chief sub-editor of Cosmopolitan, she also ensure that this reaches you without spelling mistakes and other blunders. These two moths are a Sallow Kitten and a Gold Spot. The blue thing is a pencil for scale. It is actually quite an interesting pencil as it is made out of recycled denim jeans, but the moths are more interesting. Especially the Gold Spot, whose colouring is dramatic by homely British standards. Why its rather humdrum lifestyle, favouring dampish places with plenty of grasses, should justify this bedizening and bedazening, is a mystery, at least to me. I have added the issue to my stash of questions to try to answer when I have more time. I dropped the Gold Spot's eggbox which set it a-fluttering, allowing me to take a picture of more of its wings than you can usually see (below). It was preparing for take-off, however, so I couldn't stop the blurring. I have to say that to my eye, the Sallow looks more like its similar but rarer relation the Poplar Kitten, but I don't think it can be as the latter's flight season ends in July. But I will check with the sage Jax of Yorkshire Butterfly Conservation; or one of my kind expert monitors may comment. 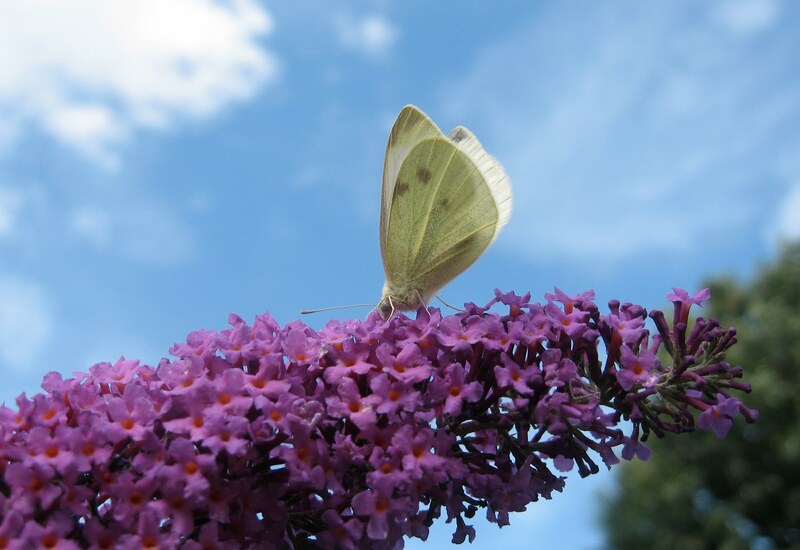 What did British butterflies do before Buddleia davidii came along? 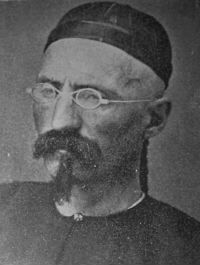 The bush is the one sure guarantee of drawing the insects to your garden, yet it only arrived in Europe from China in 1869 when Pere Armand David, that amazing naturalist who was also notable for unusual facial hair - see small pic, sent one to his friend and fellow-naturalist Adrian Franchet in Paris. The plant shares David's name with that of the obscure but delightful-sounding Rev Adam Buddle, a 17th century country parson in Essex who was an expert on mosses and wrote a very good British flora which unfortunately no one would publish in his lifetime. His is a moral tale for anyone who feels that their talents have not been warmed by the lamp of fame. Thanks to Linnaeus, who named the 100-strong Buddleia family after him, he is now remembered by one of the best-known and loved garden (and bomb site) plants in the world. It has to be added that the US states of Oregon and Washington consider Buddleia davidii a noxious weed because of its formidable invasive powers, but I (and I am sure most people) side with Oxford botanists whose monograph on B.davidii describes its arrival in the UK in 1890 as "in every sense a useful introduction, exploiting a previously unfilled niche, and its development of an associated fauna as well as the attractiveness of its flowers to nectar-feeding insects makes it a welcome addition to the British flora." The Americans may be forgiven, though, as they came up with the very good alternative name for the plant, Orange Eye (look carefully at the florets in the picture above). Enough of this learning. I mention the Buddleia because we took my Mum and an elderly cousin for lunch yesterday with my Aunty who lives in Boroughbridge (next to the amazing 'Roman ruin village' of Aldborough) and there were Small Whites dancing all over her Buddleia's honey-scented fronds. I was very pleased to get a picture, even though the SW is a common butterfly, as we overwhelmingly get its relative the Green-veined White at home in Leeds, and I haven't photographed a Small White in an age. Harris, Ray - The Opal Seekers. Children's Press (Collins), not dated, inscribed 1957. When Geoff Mason was given the big Minton sports car for helping M. Henri Montserrat after an accident, he little realised what a large part it would play in his life - how it would transport him and his friends to Western Queensland in search of a particular limestone ridge to look for a fortune, and how it would be largely instrumental in saving his life. And that meeting with M. Montserrat was fortunate in other ways too... Excitement piles on excitement from the moment Geoff finds his home in flames and his uncle hurt. Then there is an armed chase through the night and a train hurtles down the track between pursuers and pursued. It is a thrilling story and Geoff, with his English friend, Blue, and the stalwart aborigine, Dogfoot, battle against almost insuperable odds in their search for opals. How the boys win through holds the reader's attention to the last page. I put the trap under our biggest buddleia last night and maybe that, or the unusually warm evening, brought a variety of colourful arrivals. Three of them were Lesser Swallow Prominents, a really stylish moth with sharply distinct flashes and stripes. It is resourceful even as a caterpillar, burrowing underground to build an unusually strong cocoon in which it spends the winter. These are 2010's second brood, but I don't recall any arriving after the earlier April/June hatching. I also like these moths because they are heavy sleepers. They didn't conveniently choose to snore on, on the tips of these buddleia leaves; I arranged them. very carefully, I should add, and they didn't seem to mind. Then I tucked them up, deep inside the undergrowth of the bush. Another dash of colour was provided by this Canary-shouldered Thorn; a nice name and accurate too; the colour of its body is indeed exactly like a Canary's. It is another hardy creature, over-wintering like the Lesser Swallow Prominent but as an egg. When you think of the rigours of winter for us, large and sophisticated mammals, these little insect achievements are all the more remarkable. Finally a familiar visitor; but you can never tire of the elegant colouring of the Y moths. I notoriously muddle them (the Silver, the Beautiful Gold and the Plain Gold) but I think this is a Silver, although the Y confusingly looks gold. I was going to crop the picture to make the details clearer, but then I decided that the angular background of pastel colours rather nicely sets the moth off. Two common but interesting moths this morning. The first, looking here like a Grand Duchess out shopping in her winter gown accompanied by a small page, is a Dun-bar, a species notable for inconsistencies in its colouring. Even more varied are examples of the Common and Lesser Common Rustic, related species which can only be told apart, according to my advisers Messrs Waring, Townsend and Lewington, by examining their genitalia. I haven't got that scientific yet. The two moths here on the background of one of our strange pinkish paving stones, are both CRs or LCRs, despite their superficial difference in pattern and colour. These variations or lack of them also occur, of course, in Homo sapiens. Penny and I went out for fish and chips last night during what happened to be the qualifying time for the £8.25 Pensioners' Extravaganza, and we were observing how once people develop white hair and wear specs, they can be as hard to tell apart as Common and Lesser Common Rustics. Finally, P had doubts about whether I should include the photo below, on the grounds of obscurity and irrelevance. But I have been trying to mend our lovely Moon teapot's broken lid with superglue. It works until you try to scrub out the tannin stains along the otherwise very discreet cracks. Then it comes apart again, leaving strange shapes of solidified glue, including this one, which looks just like a very small butterfly perching on a twig. At least, I thought so. Sorry about all my metaphors and descriptions; the results of too much journalism. But you can maybe also see the complexity of my repair task, via the blurred lid fragments in the background. "Where is the moth?" you cry, as you scan what seem to be unusual photo of a policeman's helmet. And I reply: "Look more closely..." Yes, that curious object on the left is a Spectacle moth, a past hero of this blog but one of which I never tire. I didn't notice it sitting quietly under the lamp-holder at first; then I saw the curious little 'face', with the giglamps (actually more like skiing goggles) caused by the patterning above the real eyes. To complete the Spectacle's odd appearance, its forewings each have a pronounced black eyelash shape on them, when at rest. Others have compared this to a Frenchman's oiled moustache, divided in two. I have a picture of it on a post way back which I'll try to find and add here later. Meanwhile, the life of butterflies may be colourful but it is often short. I was reminded of that when I came through the garden gate from work last night and saw this melancholy eye peering up at me. It is the remains of a Peacock, I suspect after bird attack, although it may have blundered into a spider's web. Without being callous, we do have an abundance of Peacocks this year. I saw more than 20 on one bush at the Yorkshire Sculpture Park on Monday, a sight which inspired me so much that I Tweeted about it. Another one skipped out of a hydrangea just as I was pondering the remains of its dead companion. Life goes on. Some of the lesser bretheren this morning; but like the lily in the Bible, aren't they beautifully adorned? This little golden micromoth is only half the size of a sunflower seed, but its patterning is lovely, quite apart from the metallic sheen. 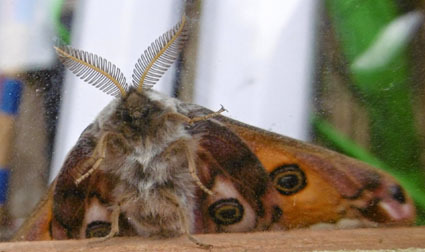 A pair of them came to the trap which I put in a shady patch of the garden, and the second was obligingly resting in the bottom of the trap with its wings outspread. I haven't yet mastered the art of photographing moths in the trap, whose partially-reflective black plastic does something odd to the light levels, so apologies that the golden gleam is dulled in the smaller picture. One up for the human retina as opposed to the camera lens. But the moth was wide awake and any attempt to move it would have led to flight. Indeed, soon after I took the picture here, off it zoomed. The pair were alongside another prominently-marked micro; about four times their size and with a vaguely skull-shaped blotch on its folded wings. Also there, were the usual crowd of assorted yellow underwings, albeit fewer than come to the trap's usual position closer to flowerbeds, assorted Rustics, a couple of Dun-bars and a fine Spectacle which perched on the bulb-holder. I'll keep that for tomorrow's post. Twelve years ago, I reported a Speckled Wood here in our part of Leeds to the local Butterfly Conservation recorder, and got a reply saying that I would be a celebrity if I could provide a photograph. That was in 1998. 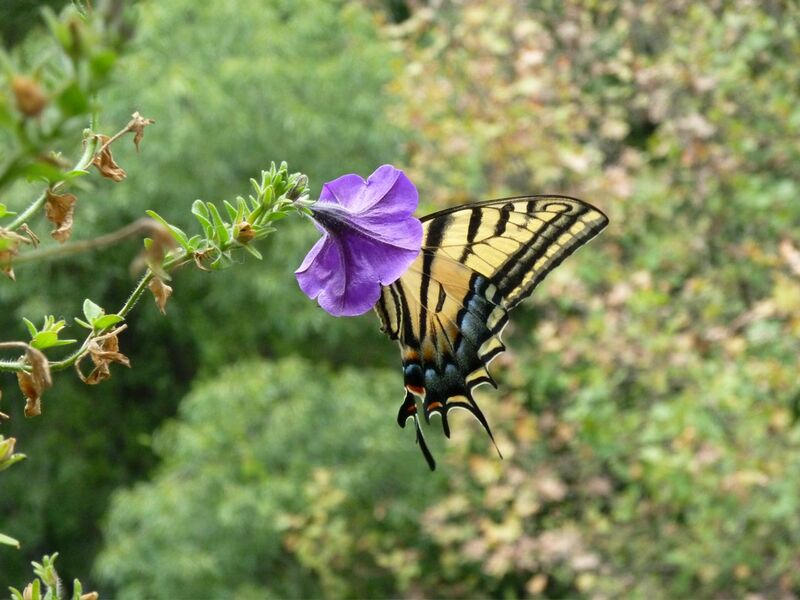 I saw the butterfly again in each of the following years but it wasn't until 2003 that I managed to get a picture (no digital macro then) and claim my moment of fame. By then it was too late. Others had overcome his scepticism and this excellent success story among Northern butterflies was generally acknowledged. Now I can be confident of seeing one in our garden almost every day from May to September, sunshine permitting. The spread of the species isn't confined to Leeds. Yesterday I had a day off and we took friends to the Yorkshire Sculpture Park, between Wakefield and Huddersfield, and there were plenty of them about, including the amorous pair above whose close association suggests that a whole lot more lie in store in 2011. I must check with Yorkshire Butterfly Conservation whether anyone is studying this phenomenon to find out why things are going so well for the Speckled Wood. Like most 'good news' stories, it is unlikely to get much attention from the national media. The sun shone all day on the Henry Moores et al, incidentally, and we saw 20 Peacocks, two Commas, a Red Admiral and two Green-veined Whites on just one Buddleia, as well as small clouds of butterflies on the meadows' sea of thistle fluff. They included the Comma above, kindly showing the very precise punctuation mark on its underwing which accounts for the name. I didn't Photoshop it on, I promise. The park is greatly worth visiting - vast and lovely grounds and an excellent, current exhibition on the wood-sculpting specialist David Nash. See www.ysp.co.uk. One small tragedy, though, was that one of those 'grass moths' which flit about the fields, thin as pencils, crashlanded in a cup of tea at the cafe, and perished. We had a glimpse of red and black yesterday, with the Sexton Beetle; today it's the turn of a very fine moth. Welcome to the Red Underwing, a jumbo beast with subtle forewing camouflage and then the blaze of red when it flies or is disturbed. I must admit that I spent a bit of time disturbing it this morning, with a drinking straw, so that you could enjoy at least a glimpse of red. It looks exotic, and indeed it is the 'butterfly' famed for congregating in large numbers in Rhodes' Butterfly Valley. Two years ago, I posted a picture of some we found not far away from there, on our holiday in Turkey. The year before that, one came to the trap in Leeds and last year Penny spotted one exactly matching the colours of a pub sunshade during her birthday treat at Tadpole Bridge in Oxfordshire. So it's a regular, and a very much-appreciated one. Look at its fine, zebra-striped underwing too, as it clings to my straw. It didn't actually enter the trap last night but perched nearby. I think it was disorientated by the light, as the white window frame was an unwise choice for its otherwise excellent camouflage. Which is why I spotted it. PS Yesterday's hornet was dead, and I thought you might like a close-up of its curious face. I wouldn't dare do this with a live hornet and wouldn't advise anyone else to either.